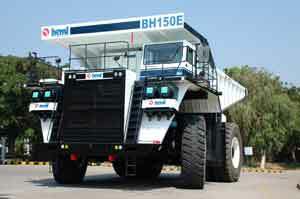 BEML Ltd., a Public Sector Company under the Ministry of Defence and a premier manufacturer of Mining and Construction equipments, has launched an indigenously developed 150T Electric Drive Rear Dump Truck. The Truck – the nation’s first – is aimed at addressing the growing demand for higher capacity equipment in the Mining Industry. The Truck was recently flagged off at Mysore for its use in the coal fields of CIL’s subsidiary, M/s. South Eastern Coal Fields Ltd., for the Gevra Project. The truck offers significant features, such as high power performance, enhanced productivity, increased reliability, excellent serviceability, exceptional manoeuvrability, superior operating comfort and improved safety. This dump truck has eco-friendly emission certified engine with electronic fuel management system to deliver maximum power and GE AC propulsion system to cater consistent performance in steep gradients. Its wide body design, higher volumetric capacity and a low loading height ensures high stability and productivity. BIPL compliments Ammann Apollo for a workhorse – the ARS 121 Soil Compactor. CASE India has maintained a leadership position in the Indian subcontinent, thanks to its market leading products, ever increasing loyal customer base and its transparent and ethical business conduct, writes Ajay Aneja. Ajay Aneja, Brand Leader, CASE India. JCB introduced a wide range of innovative and intelligent machines which exhibit a blend of technology and digital innovation to meet the demand for world class machines to build India’s Next Gen infrastructure, writes Jasmeet Singh.